What causes cataracts? Are they inherited? Are cataracts dangerous to the eye? What symptoms do people experience with cataracts? Is a cataract the same as macular degeneration or glaucoma? Can cataracts be treated besides having surgery? If I have to have cataract surgery, what can I expect during the operation and afterwards? What does “no-stitch, no needle” cataract surgery mean? What are the current methods of cataract surgery? 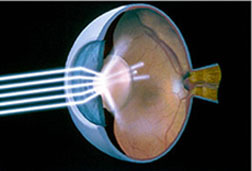 Is there such a thing as “laser” removal of cataracts? What exactly is a lens implant? Is it the same thing as an eye transplant? Are there any risks or complications of having cataract surgery? This usually occurs as a normal part of the aging process of the eye. Many times, the loss oftransparency of the lens is so mild, vision is hardly impaired. When the lens gets cloudy enough to obstruct your vision, it is then called a cataract. Cataract disease is the single greatest cause of blindness world wide. It accounts for over 50% of all blindness, and it affects over 17,000,000 people. Depending upon who you read, between 12 – 50% of all persons over the age of 65 have some form of cataract development. Yes. The lens of the eye can develop different forms of clouding that can have different effects upon your vision. For example, some cataracts can cause problems predominantly with distance vision while causing little problems with reading, and vice versa. There are some types of cataracts that will allow reasonably good vision on a cloudy day, and at the same time be disabling on a bright sunny day. Others may cause poor night vision while allowing relatively good vision on a sunny day. Cataracts can be inherited, but by far, the most common cause of cataracts is aging. Having had aging grandparents or parents with cataracts does not necessarily point to a genetic thread. Other causes of cataract development include injuries to the eye, certain medications such as steroids, systemic diseases such as diabetes, certain nutritional deficiencies, prolonged exposure to ultraviolet light, and other less common causes. Occasionally, babies are born with cataracts. Rarely do cataracts pose any danger to the eye physically. Occasionally they can get of sufficient size to cause acute glaucoma or inflammation of the interior of the eye. 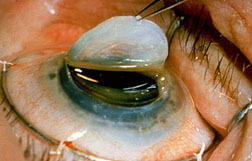 Most cataracts are not harmful to the eye itself and are usually not considered emergent or urgent conditions. The eye works very similarly to a camera (See the Eye Anatomy page for details). Light rays travel through the eye and are focused by the cornea and lens onto the surface of the retina which acts like film inside of a camera. 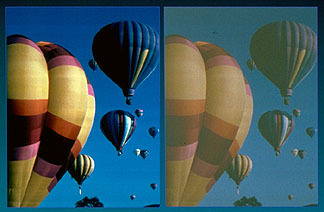 When the lens becomes cloudy, depending upon the degree and type of cloudiness, the vision can become impaired in several ways. The typical symptom of cataract formation is blurred vision which frequently is very slow, progressive, and painless. Glare at night and halos around lights are frequently experienced as well. One may notice that colors have become washed out, or that images have taken on a yellowish cast. Many persons experience frequent eyeglasses changes. Double vision is occasionally experienced. There are some situations where distancevision actually improves with cataract development. This is frequently called “second sight.” This occurs when farsighted persons experience improved distance vision with less dependency upon their glasses. 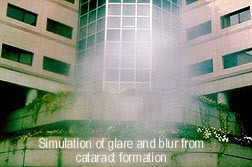 This effect from cataract development however is usually only temporary. Although most cataracts occur in older adults, they can appear in children, and can affect one or both eyes. Often they are present at birth and may appear as a white spot in the pupil. Usually a cause for the cataract is unknown. 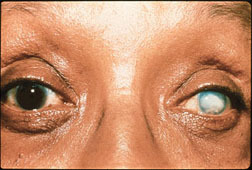 However the cataracts could be inherited or develop because of an infection or disease before birth, or due to injury. Unlike adults where cataracts are usually not an emergency, cataracts in children may cause permanent loss of vision due to amblyopia if a severe cataract is not removed quickly. Visual rehabilitation in children can be a long and difficult process since often, these children will need patching therapy, frequent changes in their eyeglasses prescriptions, and even muscle surgery because of crossed eyes (see strabismus) to minimize amblyopia as much as possible. Many of the symptoms of cataract development can occur with other ocular disorders. For example, blurry and glary vision can occur with cataracts, but can also occur with glasses problems. Therefore, the only way to definitively detect the presence of early cataract development is with a slit lamp exam (see diagnostic services for more detail) through a dilated pupil. This is usually done as part of a comprehensive eye examination. Cataract development due to the aging process usually affects both eyes, although commonly one eye is more affected than the other. Other causes such as injuries may affect only one eye. Absolutely not, although cataracts can be present along with other diseases of the eye such as macular degeneration or glaucoma. Wear protective eyewear when necessary. Avoid prolonged exposure to ultraviolet light. Wear UV protective eyewear when outdoors in bright sunlight long enough to get a sunburn. Maintain a healthy lifestyle. While there is no universal agreement on the effects of smoking and cataract development, many believe that there is a relationship. Eating foods rich in anti-oxidants may be helpful. There are studies that show that high doses of Vitamin C slows the progression of age-related cataract development. Other studies are being done investigating other anti-oxidants and their effect upon cataract development. Maintain control of your diabetes. Elevated blood glucoses over a long period of time can accelerate the progression of cataracts. Many times YES!! Rarely is a cataract emergent that other options cannot be considered or discussed. Much will depend upon the type of cataract you have and what your visual needs are. Many times, symptoms of cataracts can be helped simply by updating the eyeglasses prescription. Controlling unwanted glare is often possible with AR (anti-reflective) lenses (click Common Optical Terms for additional details) or the addition of tints added to your lenses, or with the use of sunglasses. 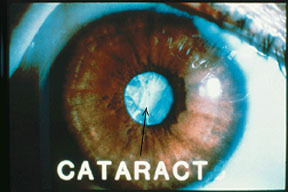 Many times, cataracts are small and remain stable for years. The experience of cataract surgery is different with every surgeon. At Davidson Eye Associates, cataract surgery is a process that focuses on maximum visual rehabilitation with maximum convenience to our patients. In general, having your cataract taken care of takes no more than two to three hours out of your day, and the surgery itself takes 15 to 20 minutes on the average. exactly is a lens implant? Is it the same thing as an eye transplant?” on this page). Other details relating to your surgery such as pre-operative drops, the time of your surgery, any planned anesthesia, and other factors related to your surgery, are discussed. On the day of your surgery, you’ll arrive at the outpatient unit at Lexington Memorial Hospital, where the nurses will prepare you for your surgery. Generally, they will check your blood pressure, ask you questions about your physical condition, medications you take, etc. If you are diabetic, they will do a blood sugar check and report your results to your doctor. Your face will be cleaned, and dilating drops instilled into the eye that will be operated on. Generally, no IV will be required (uncommonly, some patients require IV sedation), and most of the time, you will wear a hospital gown over your clothes. You will then be transported to the operating room, and numbing drops will be instilled into your eye. These drops may sting a little at first, but then your eye will be numb. Your face will then be cleaned again, and a sterile eye drape will be placed over your eye. You will then be given a light to look at while your surgery is performed. Of course during the procedure, you will not “see” any of the details of your surgery. While gazing at the light above, you may do so comfortably as though you were watching TV. Strict attention is paid towards patient comfort, and any level of discomfort during the operation is a rarity. Only under extremely unusual situations are patients ever put to sleep. Most of the time, the entire surgical experience can be done without the use of any needle injections, IV’s, or stitches. Usually, only numbing drops are needed for a comfortable operation. Numbing injections are rarely needed. After your surgery, you’ll be brought back to the holding area where the nurses will do a final check and go over instructions. You will then be discharged. Most of our patients find that when they return home, they can do most of what they want to do. Many patients return to work, go golfing, find that they can drive, and perform most other activities. For those few patients that require heavy sedation, they can usually resume their normal activities within a day or two. In the unlikely event of a complication, your doctor will instruct you as to any limiting activities. Your doctor will generally see you the next day in the office, and once again, up-to-date instructions will be reviewed. You will put eye drops in your eyes 2-4 times a day for 2-3 weeks and wear a small protective eyeshield at night for 4 or 5 days. This is to keep you from accidentally rubbing your eye in your sleep. Discomfort after surgery is usually only minor, and is usually described as an itch, slight irritation/foreign body sensation, or some minor soreness. This generally does not require any pain medication beyond for example, Tylenol. Some minor redness may also be present, although frequently, the eye is fairly clear. Discomfort, when present, generally does not last beyond a few days to a week. Severe pain is rare, and usually indicates a problem for which you need to be seen. Patients are usually seen again in 3 weeks, and if all is well, are discharged, often with a new eyeglasses prescription. Follow up beyond, however, can vary, depending upon your situation and circumstances. At Davidson Eye Associates, we use the most modern method of cataract removal available called phacoemulsification (see question 14 for details). In most cases, it takes approximately two hours out of the day to have this done, and the procedure itself rarely takes over 15 minutes. Generally only numbing drops are used, and IV needle sticks or injections of medicine around the eye are rarely necessary. The incision into the eye for the operation is usually less that 1/8th of an inch, not much more than a puncture wound. Therefore, the incision is so small that it is actually self-sealing and usually does not require any stitches to close. Thus the term, “no-needle, no-stitch.” In fact, right after the surgery, the eye is rarely even red, and most patients are generally able to resume their normal activities by the next day. Uncommonly, there are circumstances, however, where it is actually safer to remove an unusually hard or extremely large cataract through a larger incision. With these types of situations, some stitching is necessary for proper healing although the stitches used are as fine as human hair, and generally dissolve with time. PHACOEMULSIFICATION: This technic is a highly advanced method of cataract removal and has been the favored technic at Davidson Eye Associates for over 25 years. 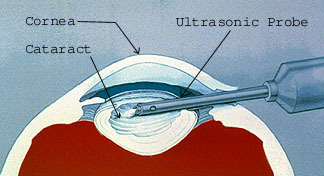 Here, an ultrasonic oscillating probe is inserted into the eye through a tiny incision no larger than a puncture wound. The probe breaks up the center of the cataract into extremely tiny pieces. 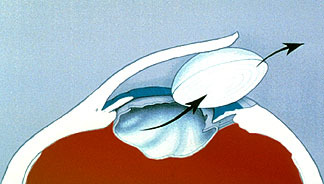 The fragments are then suctioned from the eye at the same time. After the cataract is removed, a lens implant (see question 15 for details on lens implants) is permanently inserted into the eye to help focus light rays onto the surface of the retina as the natural lens used to do before it turned into a cataract. The incision created is so small that it rarely requires any stitches to close, and usually requires no more than numbing drops to do the procedure. The advantages of this technic is that the eye heals rapidly allowing patients to resume normal activities almost immediately in most cases. It is considered by many as a safer operation because of a small wound size, and it causes little astigmatism changes in the eye. EXTRACAPSULAR CATARACT EXTRACTION (ECCE): Still used in some cases, this technic involves removing the center of the cataract all in one piece using a rather large incision into the eye. More anesthesia is usually required in the form of IV sedation, and injections of numbing medicine around the eye is necessary for maximum safety. The numbing injections are usually not felt by the patient because of the sedation. Because of a larger incision, stitches are required. Such stitches are finer than human hair and are generally not felt by the patient. There are generally more limitations following ECCE, and discomfort is usually minor as with phaco-emulsification. Patients generally experience excellent visual results as well when this technic is used. For many surgeons that practice phaco-emulsification as their primary method of cataract removal, ECCE is still occasionally necessary for unusually hard or large cataracts and may be a safer operation for such cataracts. LACS (Laser Assisted Cataract Surgery): There has traditionally been much public confusion and misinformation over the term “laser” as it applies to cataract surgery since many surgery advertisements in the past inaccurately use the word “laser” to describe “phacoemulsification.” However there is now technology that allows part of the cataract surgery do be done using laser technology. There is currently debate on the advantages/disadvantages of this new and upcoming technology. 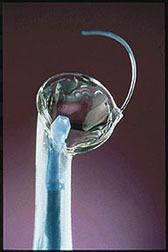 LACS does not replace phacoemulsification but is used in some steps of the cataract procedure. Either way, this technology will continue to advance, but still has a ways to go. Patients should understand however that even with future laser technology, an incision into the eye will always be necessary. During cataract surgery, the natural lens of the eye that “turned bad” is removed resulting in a loss of focusing power for the eye. This situation would be similar to taking photographs without a camera lens. The pictures would be extremely blurred. When the natural lens of the eye is removed, a lens of some sort must be used for the eye to focus.Years ago, when patients had cataract surgery, they wore thick cataract glasses to do the focusing that their natural lens did before it turned into a cataract. Later on, special contact lenses were developed to allow cataract patients to focus. Many older adults however had trouble managing them, and infection was a problem for patients who slept in them. For the past 40 or so years, intraocular lenses (IOL’s or “lens implants”) have evolved with amazing success, and lens implantation is now considered a standard part of cataract surgery. The IOL is a tiny, lightweight, clear plastic lens placed in the eye, usually in the same location as your natural lens, which replaces the natural lens of the eye that turned into a cataract. The IOL remains a permanent part of the eye for a lifetime and only in extremely rare circumstances becomes troublesome. IOL’s can be a hard plastic, soft plastic, or soft silicone. At Davidson Eye Associates, we use predominantly a soft acrylic that actually folds, allowing placement into the eye through the same tiny puncture-like insicion used for cataract removal. The lens is placed in proper position and allowed to unfold in the eye. Such technology shortens the recovery time following surgery. 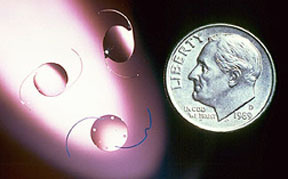 IOL designs, materials, and implantation technics continue to evolve. An IOL or “lens implant” is different that an “eye transplant,” which is a term that actually means a “corneal transplant.” The cornea is the front part of the eye (see Anatomy of the Eye for details) that functions like the window for your vision. Like the lens, the cornea has enormous focusing power for the eye. Some diseases can cause permanent clouding of the cornea making it necessary to replace the cornea in order to see again. These corneas come from patients who have donated their eyes at their death. The corneas are preserved in an eye bank. Davidson Eye Associates uses the most modern method of cataract removal and lens implantation available anywhere in the world. However all operations carry some form of risk. Risk for cataract surgery can vary depending upon many circumstances such as the type of cataract, co-existence of other diseases (i.e.diabetic eye disease), the state of one’s overall health, the presence of other eye diseases, and one’s own eye anatomy. While most of the time cataract surgery is considered a low risk operation, no surgery is completely risk free. Even with modern technology in an outpatient setting, cataract surgery should never be trivialized. The most serious complication with cataract surgery is visual loss. 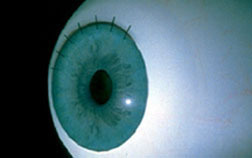 This is very uncommon but could result from an intraocular hemorrhage, damage to the optic nerve with a retrobulbar injection (injection of numbing medicine behind the eye–rarely used by Davidson Eye Associates), postoperative intraocular infection, retinal detachment, macular edema (swelling of the macular area), and permanent corneal swelling. Fortunately, most of these complications can be treated successfully. Total loss of vision due to untreatable circumstances is exceedingly rare. This list of complications is by no means complete, so it is important that you discuss risks and complications related to your particular circumstances with your ophthalmologist, or e-mail us for any questions that you may have.